Sign up for Flower Power Club Emails here! Let's Say Goodbye to Old Man Winter with Daffodils! Our Blog is Now in Bloom! 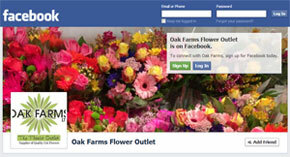 Oak Farms Ltd - The Flower Outlet of Leamington, Ontario, Canada, is a full service flower shop, offering a variety of services tailored to your needs. The Flower Outlet staff works hard with passion and compassion for the love of flowers and the client. We believe in continuing education and techniques within the floral industry to always provide modern styles and amazing displays.